As the loss of West Antarctica's ice sheet threatens to raise sea level and flood the world's coasts, scientists must improve projections by understanding the physics where glaciers meet the ocean. One of the most devastating potential impacts of global climate change is a large global sea level rise over the coming century and beyond. This would inundate heavily populated, low-lying coastal areas worldwide—more than 1 out of every 100 people on the planet live less than 1 meter above sea level. The main root of this threat is the potential collapse of West Antarctica’s marine-based ice sheets—massive expanses of glacial ice that rest not on land but the ocean floor—in particular, those where warm ocean waters circulate nearby [Intergovernmental Panel on Climate Change (IPCC), 2013]. Fig. 1. 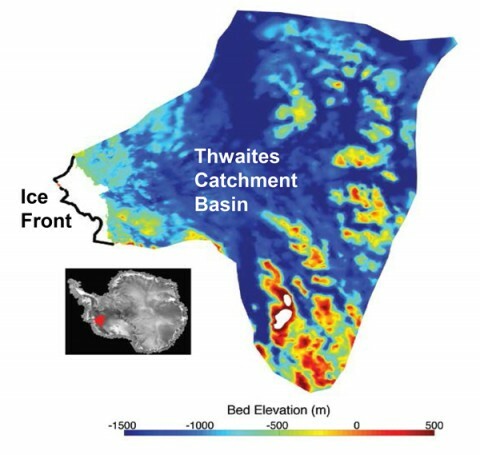 Subglacial elevations of the bed beneath the Thwaites Glacier, West Antarctica, covering the area shown in red in the inset map in lower left. North is to the left. The thick black line at center left of the main image indicates the present-day ice shelf front. The dark blue colors indicate the presence of a remarkably deep, marine-based ice sheet, reaching from the ocean to far inland. Credit: Modified from Joughin et al. . Reprinted with permission from AAAS. Readers may view, browse, and/or download material for temporary copying purposes only, provided these uses are for noncommercial personal purposes. Except as provided by law, this material may not be further reproduced, distributed, transmitted, modified, adapted, performed, displayed, published, or sold in whole or in part, without prior written permission from the publisher. Thwaites Glacier in West Antarctica fits this profile (Figure 1). Over this past year, both observational [Rignot et al., 2014] and modeling [Joughin et al., 2014] studies suggest that this collapse has already begun. Against this backdrop, there is a pressing need to calculate robust, credible projections of sea level rise from outlet glaciers such as Thwaites. However, the unique nature of the West Antarctic physical environment presents both logistical and technical challenges that have held back progress. Here we provide a brief overview of the field of glacier-ocean interaction and suggest steps to advance the projections of sea level change for Thwaites and other key outlet glaciers. Natural and human causes both contribute to global climate change, and it is sometimes challenging to discern whether observed changes are due to one or the other. In the case of glaciers affecting global sea level, however, the IPCC concluded that anthropogenic forcing played a statistically significant role in the retreat of glaciers during the late 20th century [Church et al., 2013]. The regional climate change now occurring in West Antarctica is a pressing concern as collapsing ice shelves, like those on the Antarctic Peninsula, could lead to a larger rise of several tens of centimeters in this century [IPCC, 2013]. Taken together, these IPCC conclusions are a wake-up call. A West Antarctic meltdown would transform coastlines, affecting infrastructure and livelihoods in densely populated areas around the world. Projecting sea level change arising from West Antarctica is a challenging science problem and is an equally important societal problem, having deep ramifications for governmental policy on greenhouse gas emissions. A West Antarctic meltdown would transform coastlines, affecting infrastructure and livelihoods in megacities and other densely populated areas around the world. The deluge would also threaten fragile ecosystems such as mangroves, coral reefs, sea grass meadows, and salt marshes—all of which provide the livelihood of many coastal communities. This rise in sea level has already begun. Prior to the 1990s, sea level was largely recorded by tide gauges fixed to coastal structures grounded in the solid Earth, showing over the last 2 centuries a rise of just over 1 millimeter per year. Beginning in the 1990s, satellites have provided near-global altimetry coverage of the ocean. Since then, both satellites and tide gauges have indicated a rise of about 3 millimeters per year. Taking into consideration all sea level observations, the seas are not only rising, but that surge is accelerating [IPCC, 2013]. Going forward, outlet glaciers, such as Thwaites, are likely to rapidly make large contributions, drowning out all other sources. To date, the land ice of West Antarctica has made a small contribution, by way of outlet glaciers, to the observed global rise. But going forward, outlet glaciers, such as Thwaites, are likely to rapidly make large contributions, drowning out all other sources [Mooney, 2015]. Although this meltwater would spread around the globe, the amount of actual sea level rise for a given region depends on many factors. Gravitational changes and effects due to changes in water temperature and salinity lead to nonuniform regional sea level rise. A retreating glacier reduces the burden on the solid Earth below, causing crustal deformations that produce variations in the vertical movement of the Earth’s surface, especially near the ice sheets. Dynamical effects arising from changes in atmospheric pressure also play a role in distributing meltwater, as do geostrophic ocean currents that flow along the lines where pressure gradients are counterbalanced by the Coriolis effect associated with the Earth’s rotation. All of these factors affect the projections of local sea level change that coastal planners must prepare. Planning for a large sea level change, perhaps on the order of 1 meter in a century, requires reliable projections of the contributions from land ice. But the future climate of West Antarctica is uncertain, and the physical factors that govern the collapse of outlet glaciers like Thwaites are poorly understood—in particular, a peculiar glacier instability mechanism likely triggered by warming ocean waters in a changing climate. A marine ice sheet is grounded on bedrock, below the surface of the sea. An ice sheet grows by receiving more snowfall at its surface than it loses by melting and outflow. As it grows in bulk, gravity begins to pull it downslope and into the ocean. Eventually, the leading edge forms a cantilevered ice shelf that floats on the water but remains attached to the anchored part of the ice sheet. Recent research has revealed a complex situation, as stabilizing and destabilizing factors come into play. For example, gravitational effects close to the grounding line can stabilize the ice sheet. Also, as an ice shelf grows in area and thickness, it can buttress the inland ice, stemming its outflow. If this happens, the grounding line can stabilize or advance, thereby slowing sea level rise. But if the grounding line retreats, sending inland ice further afloat, the shelf may begin a runaway collapse. As the grounded surface area of the outflowing glacier decreases, so does its friction against the bedrock, allowing it to flow with greater ease. It may also shorten as icebergs begin to calve off, possibly leading to complete shelf disintegration. This allows the inland ice to accelerate its flow into the ocean—and accelerate sea level rise. Indeed, when Antarctica’s Larsen B Ice Shelf collapsed in the early 2000s, the inland ice flow sped up nearly tenfold, proving that a mechanical link exists between ice shelf and inland ice sheet. Some areas of the West Antarctic Ice Sheet are particularly vulnerable to a runaway collapse, where the bedrock deepens inland [Mercer, 1968; Weertman, 1974]. This means the grounding line retreats underneath inland ice that is increasingly thicker, leading to an increase in the volume of ice that flows past the grounding line. Marine ice sheet instability may have already initiated on Thwaites Glacier and nearby Pine Island Glacier, leading to abrupt and irreversible ice loss. This marine ice sheet instability may have already initiated on Thwaites Glacier [Joughin et al., 2014], as well as on the neighboring Pine Island Glacier [Favier et al., 2014], leading to abrupt and irreversible ice loss, possibly as a response to climate forcing. The Thwaites Glacier (Figure 1) sits over a bowl-shaped depression, or catchment basin, in the ocean floor. The deepest part of this depression is more than 1500 meters below the surface of the sea. Thus, the grounding line of the glacier could retreat to this depth if the glacier retreats far enough. Amplifying this threat is a potential trigger for this instability that surrounds the region: a mass of warm water known as Circumpolar Deep Water (CDW). Circling the continent via the Antarctic Circumpolar Current, it carries the potential to melt an ice shelf at its base. This would weaken its ability to buttress the inland ice, destabilizing the grounding line and initiating a large-scale collapse [Alley et al., 2015]. At many locations along the continental shelf break, cold polar water pushes back against the CDW, creating a barrier (analogous to an atmospheric weather front) known as the Antarctic Slope Front, which blocks CDW from getting onto the shelf. But this barrier may be ephemeral: simulations suggest that under some models, climate change may breach it within this century, rapidly melting the ice shelf base [Hellmer et al., 2012] and eventually leading to its collapse. In other locations, such as in front of Thwaites Glacier, the Antarctic Slope Front is already absent, and warm waters flood the shelf, coming in direct contact with the glacier and rapidly melting it [Thoma et al., 2008]. Given the potential importance of West Antarctica to future global sea level and our current knowledge of glacier instability, why is there so much uncertainty about its future? The main reason is that there is still no robust, credible model for the interaction of melting ice sheets with the ocean. Scientists have made significant progress in sea level research in general but less so regarding the contribution of glacier-ocean interaction, as the IPCC  report points out. One reason is the incompleteness of observational data sets upon which such a coupled model could be constructed. Satellite remote sensing has revolutionized the ability to monitor the surface of West Antarctica in recent decades, providing unprecedented streams of data on glacier volume and velocity. But detailed information about the nature of the bed upon which the ice sheet rests has been less forthcoming, and observations of the ocean waters at the periphery [Jacobs et al., 1996] and beneath have been challenging to acquire. Another gap is theoretical. Outlet glaciers reaching the ocean can disintegrate in two principal ways: melting by warm waters or by calving ice into the ocean. Although there is arguably a reasonable understanding of how outlet glaciers melt, there is a major gap in knowledge concerning the physics of calving. As a rough estimate, half of the current ice loss in West Antarctica is by melting where the glaciers meet the ocean, and half is by calving. In a scenario of rapid retreat, it is conceivable that a large fraction of the loss would be due to calving. The process of calving is poorly understood; thus, models of that process are dubious, and resulting sea level projections are uncertain. Understanding calving might turn out to be as difficult as understanding earthquakes: a quasi-analogous fracture process that is a notoriously difficult problem. Another roadblock is the technical and software engineering burden of coupling glacier and ocean models. In almost all IPCC models under climate change forcing, the ocean occupies a fixed geographical volume. This is a historical artifact dating back to the models’ formation, when scientists did not envision the need to change ocean volume. Clearly, to simulate ice sheet retreat, simulated oceans must change their vertical and horizontal extents as the ocean invades the space occupied by the ice sheet and receives meltwater from the glacier. This requires extensive reengineering of global climate models. This reengineering can happen only with cooperation between disciplines. By and large, glaciological modelers have worked on glacier codes using specified ocean forcing, and ocean modelers have worked on ocean codes using specified glacier forcing. These discipline-specific activities serve an important role as international forums for developing and comparing models in the individual fields of glaciology and oceanography. But to arrive at credible projections of global sea level, these two activities must forge an overlap going forward to carry out an interdisciplinary comparison of coupled glacier-ocean models. In order to provide coastal planners with credible projections of the rising seas, scientists will need to develop and validate coupled glacier-ocean models, forced under various climate change scenarios. Such models in turn require augmenting observations via both sustained remote sensing and in situ measurements on the glacier and in the water. To move toward coupled, interactive glacier-ocean models, the Climate and Cryosphere (CliC) project of the World Climate Research Programme (WCRP) launched a targeted activity focused on modeling of West Antarctica at a meeting held 27–29 October 2014 at New York University in Abu Dhabi. The 30 participants represented a crosscut of glaciological and ocean modelers spanning the international community. Achieving credible projections of sea level change will likely require international cooperation between science and space agencies. The meeting resulted in the establishment of the Marine Ice Sheet–Ocean Model Intercomparison Project (MISOMIP). This project aims to develop a suite of coupled glacier-ocean model benchmark tests in idealized model configurations, followed by regional simulations of specific outlet glaciers, such as the Thwaites. Further technical details for those interested in participating in the activity are found on the CliC website. Achieving credible projections of sea level change will likely require international cooperation between science and space agencies. This will be a lengthy activity, taking decades to arrive at credible results and requiring significant investment. Given the potential threat to the coastal environment, however, there may be little choice other than to move forward with an accelerated, coordinated, and sustained international effort. Support for the workshop was generously provided by the New York University Abu Dhabi Research Institute, the National Science Foundation Antarctic Integrated System Science Program, the NASA Cryospheric Program, and the WCRP CliC. The incipient MISOMIP team collectively contributed to the content of this article: Ben Galton-Fenzi, University of Tasmania, Hobart, Tasmania, Australia; Byron Parizek, Pennsylvania State University, University Park; Dimitri Menemenlis, NASA Jet Propulsion Laboratory, Pasadena, Calif.; Eric Larour, NASA Jet Propulsion Laboratory, Pasadena, Calif.; Frank Pattyn, Université Libre de Bruxelles, Brussels Belgium; Gaël Durand, Laboratoire de Glaciologie et de Géophysique de l’Environnement, Saint-Martin d’Hères, France; Hyun-cheol Kim, Korea Polar Research Institute, Incheon, South Korea; Ian Joughin, University of Washington, Seattle; Jeff Ridley, Met Office, Exeter, U.K.; Kazuya Kusahara, Hokkaido University, Sapporo, Japan; Mats Bentsen, Bjerknes Center, Bergen, Norway; Michael Dinniman, Old Dominion University, Norfolk, Va.; Nicolas Jourdain, Laboratoire de Glaciologie et de Géophysique de l’Environnement, Saint-Martin d’Hères, France; Pierre Mathiot, British Antarctic Survey, Cambridge, U.K.; Ralph Timmermann, Alfred Wegner Institute, Bremerhaven, Germany; Robert Hallberg, Geophysical Fluid Dynamics Laboratory, National Oceanic and Atmospheric Administration, Princeton, N.J.; Rupert Gladstone, Arctic Center, Rovaniemi, Finland; Ryan Walker, University of Maryland, College Park; Sebastian Mernild, Centro de Estudios Cientificos, Valdivia, Chile; Sebastian Goeller, Alfred Wegner Institute, Bremerhaven, Germany; Sophie Nowicki, NASA Goddard Space Flight Center, Greenbelt, Md. ; Steve Price, Los Alamos National Laboratory, Los Alamos, N.M.; Tore Hattermann, Akvaplan, Tromsø, Norway; Won Sang Lee, Korea Polar Research Institute, Incheon, South Korea; Xylar Asay-Davis, Potsdam Institute for Climate Impact Research, Potsdam, Germany. Church, J. A., et al. (2013), Sea level change, in Climate Change 2013: The Physical Science Basis. Contribution of Working Group I to the Fifth Assessment Report of the Intergovernmental Panel on Climate Change, edited by T. F. Stocker et al., pp. 1137–1216, Cambridge Univ. Press, New York. Favier, L., G. Durand, S. L. Cornford, G. H. Gudmundsson, O. Gagliardini, F. Gillet-Chaulet, T. Zwinger, A. J. Payne, and A. M. Le Brocq (2014), Retreat of Pine Island Glacier controlled by marine ice-sheet instability, Nat. Clim. Change, 4, 117–121, doi:10.1038/nclimate2094. Hellmer, H. H., F. Kauker, R. Timmermann, J. Determann, and J. Rae (2012), Twenty-first-century warming of a large Antarctic ice-shelf cavity by a redirected coastal current, Nature, 485(7397), 225–228. Intergovernmental Panel on Climate Change (IPCC) (2013), Summary for policymakers, in Climate Change 2013: The Physical Science Basis. Contribution of Working Group I to the Fifth Assessment Report of the Intergovernmental Panel on Climate Change, edited by T. F. Stocker et al., Cambridge Univ. Press, New York. Jacobs, S. S., H. H. Helmer, and A. Jenkins, (1996), Antarctic ice sheet melting in the southeast Pacific, Geophys. Res. Lett., 23, 957–960. Joughin, I., B. E. Smith, and B. Medley (2014), Marine ice sheet collapse potentially under way for the Thwaites Glacier Basin, West Antarctica, Science, 344(6185), 735–738. Mercer, J. H. (1968), Antarctic ice and Sangamon sea level rise, IAHS Publ., 179, 217–225. Mooney, C. (2015), Scientists declare an ‘urgent’ mission – study West Antarctica, and fast, The Washington Post, Sept. 30. Stocker, T. F., et al. (2013), Technical summary, in Climate Change 2013: The Physical Science Basis. Contribution of Working Group I to the Fifth Assessment Report of the Intergovernmental Panel on Climate Change, edited by T. F. Stocker et al., Cambridge Univ. Press, New York. Thoma, M., A. Jenkins, D. Holland, and S. Jacobs (2008), Modelling circumpolar deep water intrusions on the Amundsen Sea continental shelf, Antarctica, Geophys. Res. Lett., 35, L18602, doi:10.1029/2008GL034939. Weertman, J. (1974), Stability of the junction of an ice sheet and an ice shelf, J. Glaciol., 13, 3–11. Citation: Holland, D., and D. Holland (2015), On the rocks: The challenges of predicting sea level rise, Eos, 96, doi:10.1029/2015EO036667. Published on 19 October 2015.